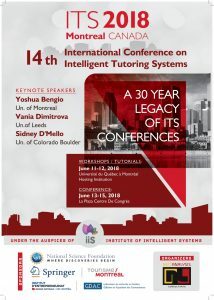 The Intelligent Tutoring Systems (ITS) 2018 conference is the 14th in a series of top-flight international conferences on the use of advanced computer technologies and interdisciplinary research for enabling, supporting and enhancing human learning. ITS 2018 Conference will celebrate 30 years of on going contribution in the field of Intelligent Tutoring Systems and will take place in the city and country of its birth: Montreal, Canada, in mid June 2018. The theme of ITS 2018 Conference traces the evolution of the academic and research achievements of the series of ITS Conferences from its birth up to now and explores its 30 years scientific impact in the field. ITS 2018 “A 30 Year Legacy of ITS Conferences” is expected to place a special emphasis on the new challenges aiming at combining this Legacy with the new Advancements in Artificial Intelligence. It aspires to regroup and promote high-quality research and trigger an exchange of ideas in the field, as well as to reinforce and expand the existing ITS network of researchers, academics, and market representatives.